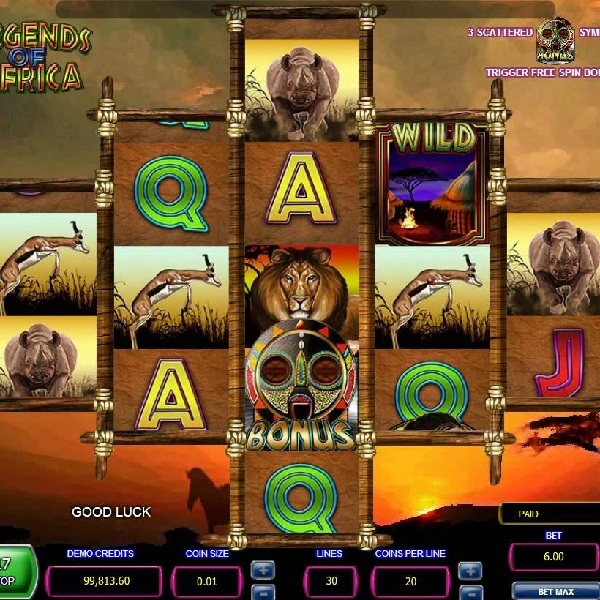 If you’ve always dreamed of going on safari but lack the means then playing the new slot Legends of Africa could soon land you with enough money. It is a 5 reel, 30 fixed payline slot set against a backdrop of animals roaming the African planes. Symbols on the reels include an African girl, a lion, a rhino, a cheetah, a zebra and an ibex. There is also a villa wild symbol and a tribal mask scatter symbol. Symbols can appear stacked on the reels and landing stacks on reels one and five simultaneously changes the payout structure so that it will pay in both directions. Landing three mask symbols triggers the free spins. It is possible to win 10 free spins with a 3x multiplier, 12 free spins with bidirectional payouts or 15 free spins with extra wild symbols.